Lucknow: Samajwadi Party (SP) founder Mulayam Singh Yadav has questioned his son and party chief Akhilesh Yadav’s decision to ally with its arch-rival, the Bahujan Samaj Party (BSP). Addressing a gathering of SP workers at the party headquarters in Lucknow, Mulayam maintained that his son had gone forth with alliance despite his objections. “Now, he (Akhilesh) has entered into a compromise with Mayawati and seats have been distributed by half. But tell us, on what basis have you given half of the seats? The son (Akhilesh) has gone ahead and done this. At that time itself, I would have raised objections… I have counted the seats (winning seats), they are around 25-26,” India’s former defence minister said. “Now tell me, who is destroying the party? The party’s own people. Such a strong party had been made. It formed the government thrice on its own and all three times I have been the CM. The work that I did as defence minister has not been done by any other defence minister till date,” Mulayam said. The remarks come days after SP patriarch created a stir in Parliament, saying he wished that Prime Minister Narendra Modi would return to power. Incidentally, Mulayam had been briefly joined by Akhilesh while the latter was on his way out of the party office. At around 1 pm Thursday, Akhilesh addressed a press conference with Patidar leader Hardik Patel from Gujarat, who pledged to offer support to any anti-BJP political front. 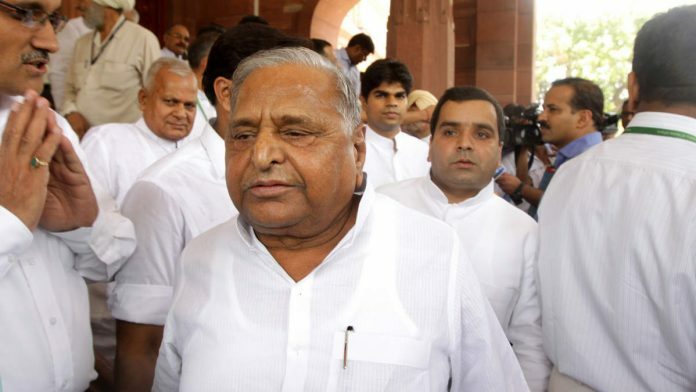 Mulayam further attacked that the party over its poll preparation, claiming that the SP’s rivals had been working in their respective constituencies for many months. He told workers that the SP’s fight was with the BJP, not with any other party. Maintaining that under his leadership, the SP had announced candidates 14 months prior to the polls, Mulayam urged the workers to come to him or his brother, Rajya Sabha MP Ram Gopal Yadav, with their applications for tickets. “There is not much time before the elections. Many people are giving names (for party tickets) to Ram Gopal, Shivpal and Akhilesh, but Shivpal has made another party now so give them (applications) to me and Ram Gopal. Both of us will decide contestants,” he said. The three-time UP CM further raised concerns over the alleged decrease in women leaders within the party. “More women should be part of the party. But not as many women are coming to the party fold today as before. Earlier, not less than 40-42 women would come to the party, but today, there are nine women. When women and girls come together, the party wins. A month ago, they were 40-42, why have only 9 women remained in the party?” he questioned. King Lear, in deepest winter. Any normal father would feel proud of a son like Akhilesh. Gave a fine account of himself as CM, especially towards the close of his term, with a genuine development vision. Wrested the party back from the old guard, took the fight upto the ECI. Once the election is over, Netaji could be despatched to the SP’s Margdarshak Mandal.